Vimeo, the online video community hosting site, has released version 2 of its free Cameo video editing app for the iPhone. 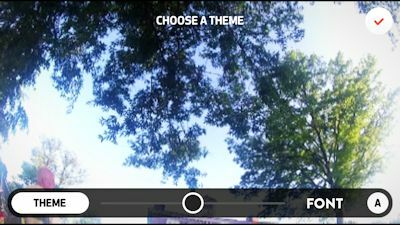 Yes, Cameo runs on a smartphone -- You can import and trim clips, add titles and soundtracks, and apply a visual movie-style theme. Then upload and share in the cloud through Vimeo, Facebook, Tumblr, and Twitter. Cameo is a little gem of an application for doing quick assemblies -- strong enough to use to assemble snazzy-looking results, but easy enough to use that you can do real editing on the fly -- or in the back seat of a car, or even in bed. Find Cameo in the iTunes store. So simple, so sensible, so smart -- The TYLT FLYP-DUO Reversible USB Cable is a USB cable with both microUSB and Lightning connectors on one end -- plus a reversable USB connector on the other end. It solves the aggravation of never having the right cable handy -- with both a microUSB connector and small Apple Lightning adapter attached on a teather. So it works in a household with both Apple and Android users, and for Apple users with microUSB-based Bluetooth or charging devices. So TYLT simply made the USB connector reversable -- It plugs in either way, and just works. Doh -- Of course! The FLYP-DUO cables also are full charge & sync -- You can use them both for power and to transfer data. As a bonus, they come in bright colors, so they're easy to find. The cable also has a tangle-free and sturdy flat design with a soft-touch finish. TYLT FLYP-DUO Cables are available for $24.99 in 1 foot lengths and $29.99 for 3 1/3 feet, in black, blue, red, and green. No more aggravation! ... at least from cables. Portable batttery packs are a great accessory when you're on the go and using your device a lot -- whether in a succession of meetings or on a long plane trip. For these kinds of needs, batteries with around 5000 mAh are a good sweet spot -- still quite portable (at around 5 ounces), and typically with the power to charge your phone plus other devices at the same time -- including tablets. In terms of capacity, 5K mAh provides the equivalent of 2 to 3 full charges for a phone. Plus these packs deliver at least 2.1 Amps of current, sufficent to power today's tablets. And they're large enough to offer multiple connectors, often standard USB plus other cable types. For all these reasons, my go-to day-trip portable battery has been the TYLT POWERPLANT portable battery back (see earlier post), which delivers 5,200 mAh and 2.1 Amps in a compact 5.4 ounce rectangular box. It has a USB connector plus one other cable. It's still available, reduced to around $20. Meanwhile, TYLT has a new line of ENERGI battery packs, including 3K, 5K, and 10K (mAh) capacity, with models featuring one or two different cables. In particular, the TYLT ENERGI 5K+ battery pack provides 5,200 mAh of capacity with 3 Amps of total output -- to charge up to three devices simultanously. To feed three devices, the ENERGI 5K+ has a standard USB connnector, plus two built-in 4 1/2 inch cables providing a Lightning connector and a micro-USB connector. The cables wrap around the sides to pack away, and the connectors are extended enough that they can reach through at least some cases. The battery is relatively light, at around 4 1/2 ounces, with a thin shirt-pocket design -- only 9/16 inches thick and 5.59 x 2.76 inches. It has a color LED indicator for the power level -- green, amber, red, and flashing. The ENERGI 5K+ is a great answer when you need reserve power for day trips -- It delivers significant power in a relatively compact and lightweight design, with the bonus flexibility to charge multiple and different devices. It's available for around $59, in blue, red, and black. Entries posted to Manifest Tech Blog in July 2015, listed from oldest to newest.